With the prevalence of Alzheimer’s disease on the rise, scientists are examining all possible avenues to help prevent, treat, and slow the progression of this curious condition. Many studies have found dietary changes to be effective at improving memory and preventing conditions such as insulin resistance and obesity. A recent study examined the effects of consuming blueberries on volunteers who were diagnosed with mild cognitive impairment, often a precursor to dementia and Alzheimer’s, and found that the fruit had a positive impact. Here’s what hourly caregivers in Rhode Island need to know about blueberries and how they affect cognitive disorders. While blueberries have long been known to decrease the risk of diseases such as cancer and heart disease, a recent study found that they might also aid in improving cognitive function. Blueberries contain flavonoids called anthocyanins, which enter the brain and enhance signaling ability in key areas known to impact cognition and memory function. Anthocyanins also have insulin-like properties that improve metabolic function and even reduce lipid levels. The study found that subjects with mild cognitive impairment showed increased brain activity, better memory function, and enhanced ability to recall words and concepts after regularly consuming blueberries for a few months. These results were compared to a group that was given a placebo. Seniors are at the greatest risk for Alzheimer’s disease, especially those who are obese, have metabolic disorders, or who already are experienced cognitive impairment. Adding a cup of blueberries a day to a senior’s diet may help reduce this risk. Blueberries are inexpensive, widely available in fresh and frozen varieties, and contain fiber and antioxidants that promote numerous health benefits for seniors. Blueberries are versatile fruits that can be eaten fresh, dried, in baked goods, juices, or even in fruit smoothies. Alzheimer’s can be extremely difficult seniors to handle alone. 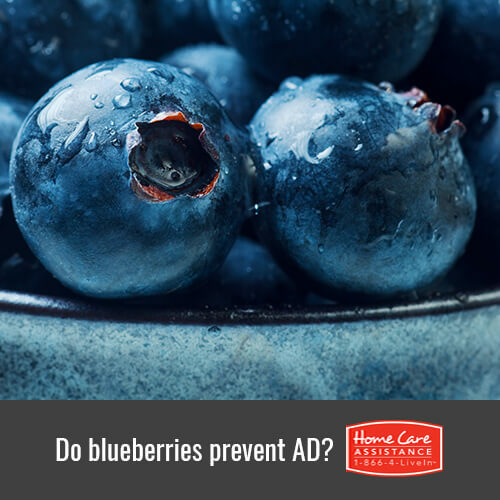 Caregivers may help seniors decrease their risk for this debilitating disease by adding blueberries as a regular part of their loved one’s diet. They may also turn to Rhode Island Home Care Assistance to help seniors manage the symptoms of Alzheimer’s and dementia. Our highly trained caregivers offer the cognitive stimulation seniors need to sharpen mental acuity and stave off dementia symptoms. Call (401) 284-0979 today to speak with an experienced Care Manager and schedule a complimentary consultation.